In 2002, a U.S. district court judge ruled a federal agency violated the Endangered Species Act in the way it registered pesticides. The ruling set in motion a dispute now entering its ninth year involving federal and state agencies, environmental organizations, pesticide makers and farm, ranch and forestry groups. In the case brought by the Washington Toxics Coalition and other environmental organizations, Judge John Coughenour ruled that before the Environmental Protection Agency cleared for use certain pesticides, it first should have consulted with federal fisheries managers on their effects on salmon. Given that Section 7 of the Endangered Species Act requires federal agencies consult when their actions could affect a threatened or endangered species, the ruling wasn't surprising, said Heather Hansen, executive director of Washington Friends of Farms and Forests, which advocates for agricultural interests on pest management issues. "But there really is no simple way to (consult)," Hansen said. "Pesticides are used in agriculture, in homes, on flea collars. So how do you consult on that?" The original wording of the law didn't take complex scenarios into account, she said. "The ESA was written thinking in terms of: If you build a dam, it's in one spot at one time and you consult on that one action," Hansen said. "That is how the consultation process was envisioned: One action, one spot, one time." At issue were 54 commonly used pesticides the toxics coalition claimed could harm threatened and endangered salmon runs. Coughenour in his ruling did not address whether the pesticides actually harmed the fish. Instead, he ordered the EPA and NMFS to consult with one another on each pesticide's impact on salmon. Environmental groups claim the agencies charged with meeting the judge's orders are dragging their feet in developing and implementing mitigating measures to protect fish. Farm and ranch groups and state agencies are challenging the science used by the National Marine Fisheries Service in developing biological opinions that shape proposed mitigating measures. The federal agencies charged with consulting on the pesticides have continually challenged one another's findings. As the EPA prepares to restrict use of many common pesticides, farmers, ranchers and foresters appear to be the big losers. According to figures from NMFS, under currently proposed actions -- which involve no-spray buffers around streams, lakes and other water bodies -- pesticide use will be restricted on 61 percent of Washington state's total land area. Fifty-five percent of Oregon, 32 percent of California and 26 percent of Idaho would also be restricted. The effects on productive farmland are even more dramatic, Hansen said. "The fallout from this -- if it continues the way it has been going -- is going to be huge," Hansen said. "It is going to be like what the spotted owl did to the timber industry." Forest managers drastically curbed logging in many of the region's mature forests in an effort to protect the range of the owl, which the U.S. Fish and Wildlife Service listed as threatened in 1990. "There are towns that have fundamentally changed because of the spotted owl -- the mill closed, the economy crashed, people left -- and I think we can see that happening again," she said. To date, NMFS and the EPA have completed two consultations -- the first on three organophosphates and the second on three carbamates. The agencies have closed the public comment period and are nearing completion on a third group, consisting of 12 pesticides. "Technically, they have completed a couple of consultations," Hansen said, "but boy, talk about a perversion of the word consultation. There has been virtually no dialogue between the two agencies. They don't get along. If you read some of the letters that have been written back and forth, neither agency trusts the other one's science." In all, the agencies are scheduled to review 37 pesticides. The EPA determined 17 of the 54 pesticides initially identified as potentially harmful to fish pose no danger. As part of the first consultation, EPA called for no-spray buffers for the three organophosphates of between 100 and 1,000 feet around salmon-bearing streams and waters that feed into those streams. The agency has asked the manufacturers of the three organophosphates to insert the restrictions on their labels, but the registrants refused. Makhteshim-Agan, Dow AgroSciences and Cheminova -- makers of diazinon, chlorpyrifos and malathion -- subsequently sued NMFS for failing to use the best available science in developing its biological opinion, or BiOp. As evidence the manufacturers point to an April 2009 letter EPA addressed to NMFS. In the letter, EPA criticized NMFS for not taking into account empirical evidence that shows pesticides aren't appreciably harming fish. "Use of these pesticides has been ongoing for decades," EPA states in the letter. "If the threatened status of the (salmon) species has not changed appreciably during this considerable period, it would appear to provide some indication that use of these pesticides are not appreciably reducing the likelihood of both survival and recovery of these (salmon species) ... yet (NMFS's) Draft (biological opinion) does not seem to take into account this empirical evidence." The letter also states that NMFS "fails to include certain studies and information provided by EPA" in developing the draft biological opinion and provided no explanation for the decision. EPA also wrote that NMFS based its buffer recommendations on the assumption that farmers would use the maximum rate that pesticide labels allow, and for the maximum allowable times to a single field. "There seem to be numerous assumptions made in the Draft that are not reasonably likely to occur and in fact are very unlikely to occur," EPA wrote. EPA apparently didn't pursue the objections its Office of Protected Resources raised in the April 2009 letter. 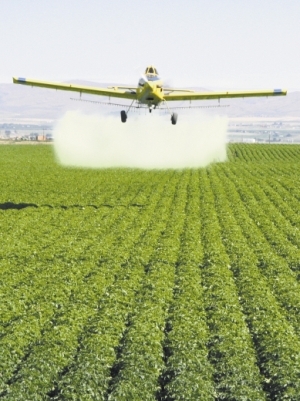 The agency later in 2009 called on pesticide manufacturers to impose the buffers. "Somehow between those critical comments and the final draft, EPA lost its backbone," said Terry Witt, executive director of the farm and forest industry group Oregonians for Food and Shelter. "All of a sudden, they just kind of rolled over, because NMFS didn't change (the biological opinion) much." Attempts to reach EPA officials in Washington, D.C., for comment were unsuccessful. Scott Rawlins, vice president of regulatory affairs for Makhteshim-Agan, contends that the consultations between NMFS and EPA also has skewed pesticide regulation by placing the 37 pesticides under the auspices of the Endangered Species Act and not the Federal Insecticide, Fungicide and Rodenticide Act, which he said is where pesticide regulation rightly belongs. "We believe FIFRA is what Congress intended to use to address how pesticides are regulated," Rawlins said. The contention, Witt said, highlights one of the many confusing issues dogging the consultations. "You've got NMFS dealing with salmonids, and they're working under the Endangered Species Act," Witt said. "Then you've got the EPA looking at pesticides that are regulated under FIFRA. "At best, I guess you could say it is confusing," Witt said. The pesticide companies' suit is now before the 4th U.S. Circuit Court of Appeals. State agencies, which expect to be asked to enforce the buffers, also have weighed in on the biological opinions. Oregon Department of Agriculture Director Katy Coba wrote in a 2009 letter to EPA Administrator Lisa Jackson that in assessing a pesticide's risk to salmon, NMFS used a risk model that "relied upon inputs that were not reflective of real-life scenarios in Oregon waters." Washington State Department of Agriculture Director Dan Newhouse wrote in a 2009 letter to Commerce Secretary Gary Locke that EPA did not use the best available science in determining the need for buffers. Further, Newhouse wrote, "The buffer widths ... effectively ban the use of the (targeted) pesticides in western Washington." "If enforced in its current form, (the buffers) would have some pretty far-reaching impacts on farmers," Newhouse said in a phone interview. "On a substantial amount of farmland, it would be very difficult to continue farming." David Duncan, chief of the California Department of Pesticide Regulation, in a 2008 letter also faulted NMFS. "Minimal attempt to correlate pesticide concentrations with particular water bodies is made, although clearly these data are available," he wrote. Duncan wrote that California already has a well-vetted program in place that protects salmon from exposure to pesticides and protects salmon habitat. "DPR's program provides straight-forward pesticide use restrictions for specific geographic areas that protect all salmonid (species)," Duncan wrote. Hansen and Witt believe the only viable solution is for the federal agencies to start over and use the best available science to develop reasonable and prudent mitigation measures that protect fish and allow farmers and foresters to grow crops and trees. "What we would like to see is somehow to get together a group that includes EPA and NMFS. Include the state agencies, because the state agencies have to implement this. Include the growers, include the registrants, include environmentalists, and come up with a process that works," Hansen said. "We need to come up with a process that works, and we don't have one now," Hansen said. Newhouse, in a recently developed white paper, is calling for federal agencies to put in place a third-party mediator to move the consultations forward. "Without cooperative efforts, the Services and EPA cannot meet their obligation under the ESA," Newhouse wrote. "We're not in any way advocating repeal or drastic changes to the ESA," Newhouse said. "That is not our goal or intention. We're advocating to look at what is actually happening on farms and use water-monitoring data we have, and regulate accordingly." Washington state, meanwhile, is preparing to implement the no-spray buffers as early as next spring. "I think that is a real potential," Newhouse said. "The state is preparing for that."